quarrygirl.com » Blog Archive » hummus king is back! we named them one of the best vegetarian restaurants in los angeles in 2010, only to hear they were shutting down six months later. now it looks hummus king is on the prowl for a new location in silverlake, but until then they’ve launched an all vegan delivery/catering service! you can check out the menu here, and order by emailing them or calling 818.919.1383.
they cater and do free delivery for groups from 10-500 people, and request 24 – 48 hours notice. the menu looks awesome, and i’m happy to see that my two favorite dishes (vegan shawarama and jalapeno hummus) are both represented! this would be great for an office lunch time, or a party/special event….in fact i’m gonna try to get my co-workers to go in on it with me. 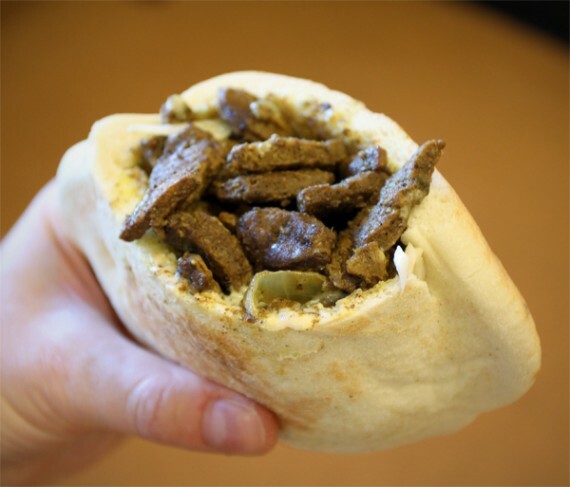 everyone loves falafel and hummus, so this should please vegans and omnivores alike. YES!!! I’m gonna be all over that storefront when it happens. …sad they’re not a local “impulse” eatery anymore. yes! i am confident in our falafel eating skillz. Sweet jesus if I could have any vegan restaurant open up an outpost on the Silver Lake side of town it would be Hummus King. Followed closely by Samosa House and Veggie Grill. Can’t wait! !